NIA CHARLESTOWN NEVIS (October 14, 2014) –Head of the Nevis Disaster Management Department (NDMD) Lester Blackett says that although Nevis did not suffer any major damage from the passage of Tropical Storm Gonzalo on October 13, 2014, the experience should serve as a reminder to Nevisians, that the Atlantic Hurricane Season is not over and that they should pay greater attention to the weather daily. 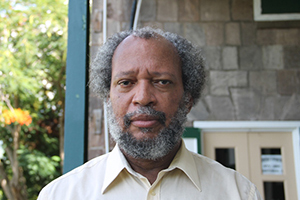 Mr. Blackett’s comment came when he spoke to the Department of Information on October 14, 2014, about the effects of the storm on Nevis. “Just yesterday we had the passage of Tropical Storm Gonzalo which has now actually become a category 3 hurricane. During the passage in Nevis we did not experience significant damage. 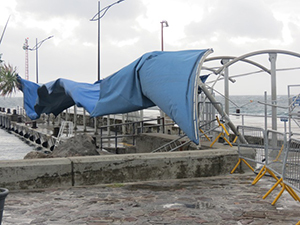 There were one or two incidents, for example Charlestown where the awning was damaged. Some trees were down and some signs but generally, I think, we went through the passage of Tropical Storm Gonzalo quite well. “Of concern, however, is the preparedness of the folks here in Nevis. Generally it seems as though most persons weren’t prepared and from the comments I’ve heard and seen on Facebook, persons weren’t really paying attention in terms of the incoming weather. It is important that we get accustomed to checking on the weather at least once a day because you can have a storm forming one or two days out and you would have a very limited time to respond. “So we want to encourage persons in the morning or in the evening to check your weather whether it’s on Facebook, whether it’s the radio, whether it’s the website. That is important,” he said. According to Blackett, the worst part of the storm veered off Nevis overnight and moved away from Nevis but neighbouring Antigua was not as lucky. “If we look at what happened in Antigua as an example of what could have happened here, and I said that could have happened here because you had the forecast being with the centre of the storm passing over Montserrat which would have meant that we would have been exposed to the most significant parts of the storm being on the northern side. “There was a shift late in the evening and that caused the centre of the storm to pass north of St. Kitts and Nevis so we got the weaker part. From my own experience in the Sea Bridge area and across by Oualie, to my mind, we were getting hurricane-force winds. So even though the outlook was that we would be getting say 40 to 50 miles an hour winds, the gusts in some cases, I am sure, went up to hurricane-force winds,” he said. The Disaster Management official also spoke to the importance of awareness and reminded persons of the deadly 2013 Christmas rains in other parts of the Caribbean and a deadly flash flood incident in Nevis which he believes should serve as other learning experiences for Nevisians. “What happened in the Grenadines and the Windward Islands last Christmas, also that lesson needs to be learnt. They thought it was just a tropical wave and the tropical wave ended up killing in the teens in terms of the numbers. We have people going home in water going over a watercourse or over a bridge and not thinking about it. They attempted to cross and they lost their lives. “We had one incident a few years ago, probably about 20 years ago at Nisbet Plantation where a gentleman and a lady in a car decided to chance the crossing and the lady ended up losing her life. “So it is important that you be aware of what’s going on around you. It is important that you are aware of whether you are in a flood prone area. It is important that you are aware whether your house stands up to a category 1, category 2, category 3 hurricane. If it doesn’t, you need to make the appropriate steps for your safety for yourself and for your family,” he urged. Blackett used the opportunity to remind persons that there were avenues available through which they could check the weather. “[Nevis] Disaster Management [Department] has created three platforms to provide information for you: our website www.nevisdm.com, our Facebook page www.facebook.com/nevisdm and our newly-launched Disaster Management app which is also free. That’s ndmd.mobapp.at and not surprisingly, we had in excess of 40 persons signing on to the website for the first time during the passage of Tropical Storm Gonzalo and also a lot of persons who were on Facebook and on our website as well.